Performers include: Joel McHale, Stephen Fry, Susannah Fielding, Christopher Mintz-Plasse, Shaun Brown, Christine Ko, and Chris Williams. This comedy series follows an adventurous magazine reporter whose world is turned upside down when he’s assigned to a desk job to supervise a young staff. Working for the Outdoor Limits magazine, renowned adventure reporter Jack Gordon (Joel McHale) has spent his life exploring the edges of the earth. However, his life is changed when the magazine’s outdoorsman founder, Roland (Stephen Fry), announces it’s becoming a web-only publication. Roland assigns Jack to head up the digital department and supervise the Millennials who make up its online team. Now that he’s taken a desk job, Jack must adapt to the times and his new world. He’s struggling to grasp the lingo of online click-bait and listicles, but his real challenge is in understanding his staff of Millenials who write about the great outdoors but who’ve never experienced it. The team includes nerdy Clark (Christopher Mintz-Plasse), a guy who knows how to survive a zombie apocalypse but who’s never been out of the city; disinterested social media expert Emma (Christine Ko); and Mason (Shaun Brown), a hipster who hasn’t spent any actual time outside. Making things more complicated is the fact that Brooke (Susannah Fielding) is Jack’s boss. She also happens to be Roland’s daughter and Jack’s ex-girlfriend. Always on hand to listen and help Jack understand the new world, bar owner Eddie (Chris Williams) is Jack’s best friend. At the magazine’s notoriously carnal company retreat, feelings resurface between Jack and Brooke as they work together to help Clark finally hook up with Emma – the same way they did five years ago. Also, Roland asks Jack to lead the staff in his absence after he accepts a once-in-a-lifetime opportunity to return to field reporting. First aired: May 8, 2017. What do you think? 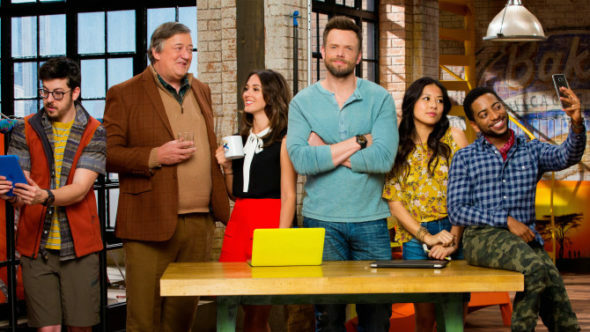 Do you like The Great Indoors TV show on CBS? Do you think it should have been cancelled or renewed for a second season? It was well written, and relatable. The actors were endearing and the characters were actually likable and unforced. This is why CBS is losing out to streaming media. Allowing sponsors to choose shows instead of helping a great show find an audience. So disappointed that it’s being cancelled. My family loved this show. And by family, that included not just me and my husband, but also my 70+ year old parents on down to my 2 teenage daughters and my 22 year old son. I can’t believe they have cancelled this show. It was one of the funniest shows CBS has put out in a since 2 Broke Girls and Mom. This show had one of the best group of cast members I’ve seen in a long time. I’ve tried watching Kevin Can Wait and A Man With a Plan and what a couple of snoozers…ZZZ ZZ. CBS needs to bring The Great Indoors back. Fantastic writing! I can’t believe this show was cancelled. It was so funny and the cast worked so well together. I would have bet the farm this show would have been renewed. The G.I.D.’s television show was one of my favourite shows currently airing. My husband (48) and I (47) never missed an episode! Please renew thIs very funny show. It’s way better than anything else on television! Please don’t cancel this show. Some of the others being renewed are just not that entertaining. Sometimes we need a break from reality shows…..